NASA recently posted its draft Announcement of Opportunity for its next Discovery competition that will select two missions, one to fly in the mid-2020s and the other in the late 2020s. I am starting to see in scientific conferences missions likely to be proposed (several of which were also proposed but not selected for the last competition that selected the Lucy and Psyche asteroid missions). NASA expects to select up to five finalists for further definition with the final selections from this candidate list. Mission costs for the spacecraft, instruments, flight software, and ground systems (the Principal Investigator costs) are capped at $500 million in FY2019 dollars. NASA provides management, the launch, and covers mission operations in addition to the PI costs. These other costs can be substantial. The projected full cost of the Lucy mission is $914-984 million and the Psyche mission is $907-957 million when the PI costs were capped at $450 million in FY2015 dollars. The PI budget can be adjusted upward by up to $20 million by adding a technology demonstration (see below) or up or down by $10-20M by selecting a less capable or a more capable launch vehicle than the baseline. Instruments, up to approximately one-third of the payload, can be contributed by foreign space agencies or governments outside of the PI cost cap. Proposed missions can use the plutonium-238 MMRTG power systems. However, including these will cost the PI budget $54 million for the first MMRTG and an additional $15 million for the second. The two concepts contending to be selected as NASA’s next planetary mission have two things in common. Both would do compelling science. Both would not begin their scientific missions until the mid-2030s. Otherwise the two missions could not be more different. 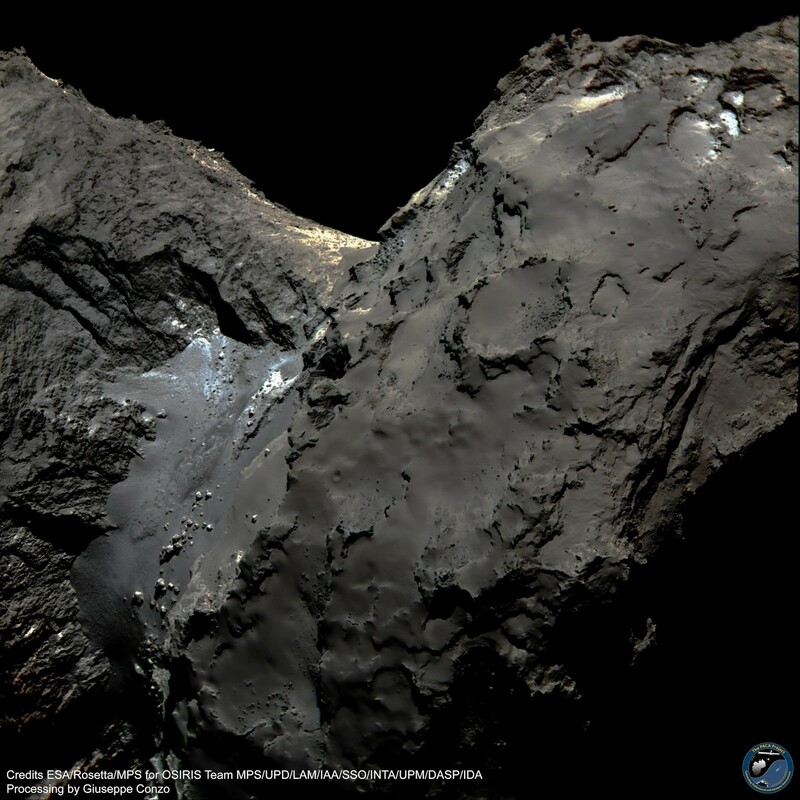 The Comet Astrobiology Exploration Sample Return (CAESAR) mission would return to the comet 67P/Churyumov-Gerasimenko that the Rosetta spacecraft and its lander Philae previously studied. The CAESAR spacecraft essentially would be a high-tech truck that would grab a small sample from the surface and then return it to Earth. Except for some ancillary observations performed by its engineering cameras, the science would begin when the samples are delivered to the exquisitely sophisticated instruments in terrestrial laboratories where they would be analyzed grain-by-grain and isotope-by-isotope. The Dragonfly mission would return to the surface of Saturn’s moon Titan that is at once both an Earth-like and an utterly alien world. The craft would alternate between flights to new locations and much longer periods as a stationary surface station. Every flight would be a voyage of discovery above a barely known surface. Every landing could provide a new site to explore in depth. Every minute of its potentially many year sojourn at Titan would be spent doing science. Both missions are finalists in the competition to be NASA’s fourth New Frontiers mission. (Previous selections were the New Horizon’s Pluto-Kuiper belt spacecraft, the Juno Jupiter orbiter, and the OSIRIS-REx asteroid sample return mission.) These are the mid-class missions of NASA’s solar system exploration program that are launched once to twice a decade. NASA’s managers selected these two concepts from a field of twelve proposals (and here). The CAESAR and Dragonfly missions differ so much because they represent different stages in the progression of exploration. Comets have already had several flyby missions and one orbiter-lander mission. As a result, the top priority among comet specialists is to progress to the next step, sample return. Further exploration isn’t the priority. The lowest risk mission that grabs and brings back the sample is the best mission. Titan, on the other hand, was studied by the Cassini spacecraft through a multitude of flybys that cumulatively mapped the surface at only low to moderate resolution. (Titan’s atmosphere was also explored by the Huygens probe that descended to the surface, but it carried out only the simplest measurements of surface’s physical properties once it landed.) The next step is to land to study the surface in detail. Titan offers a unique opportunity in the solar system where a thick atmosphere coupled with low gravity allows a science station to relocate itself by flying to new sites. For this world, exploration is the priority. However, instruments that can fit the tight mass, size, and power budgets to be flown on spacecraft are limited in their ability to explore the composition of these materials. The far more sophisticated instruments in Earth-based laboratories – which can be larger than entire spacecraft or even launch vehicles – can study samples grain-by-grain and isotope-by-isotope. The ultimate exploration goal, where technically feasible, for each world is to bring samples back to our world to explore their formation and evolution in depth. 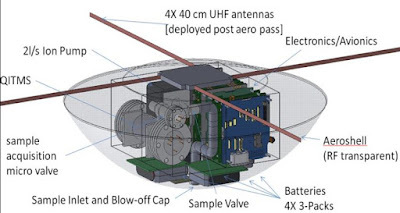 The team proposing the CAESAR mission has laid out a series of hypotheses that would be enabled by examining samples in terrestrial laboratories. Arranged in three themes, the hypotheses address different periods in the formation of the solar system starting with the transition from the interstellar cloud from which the solar system formed. The hypotheses for this theme address questions on what types of unaltered interstellar material were preserved (or not) in 67P. The next theme addresses the nature of the material in the protoplanetary disk and hence the material that would have been available to build the earliest small bodies. Here the key questions focus on whether 67P is a direct descendant of the interstellar medium or also contains high temperature silicates and organics that would have formed close to the early sun and then been blown out to the outer solar system and trapped within the material that formed 67P. The final theme addresses how the current body that is 67P formed from the initial grains of ice and rock available in the earliest solar system, and what role bodies like it played in delivering materials, especially volatiles such as water, to the planets. The CAESAR mission would be a companion mission to the previously selected, and now in flight, OSIRIS-REx New Frontiers mission. While comets are the oldest frozen remains of the solar system’s formation, several classes of asteroids are considered primitive relics of the earliest formation of solid bodies closer to the sun. The OSIRIS-REx spacecraft will arrive at one of these, 101955 Bennu, later this year. Following a thorough examination of this tiny (~245-meter diameter) body by a battery of remote sensing instruments, the spacecraft will descend, and a robotic arm will grab a sample from the surface to be returned to Earth. Collecting samples from very small bodies is an engineering challenge because the gravity is too low to enable conventional landings and surface operations. Like the Japanese Hayabusa and OSIRIS-REx asteroid sample return missions, the CAESAR spacecraft would use a touch-and-go sampling mechanism. The spacecraft would slowly descend to the surface with a sample collection system at the end of a long arm below the craft. During the five seconds that the collection system would be in contact with the surface, nitrogen gas would be used to blow the comet’s surface material into a containment system. Because comets contain ices that can freeze into a solid surface, the CAESAR collection system (unlike the OSIRIS-REx system where ices aren’t expected) would have spring loaded ripper tines to break up the surface. The mission’s goal is to collect at least 80 grams of dust and ices, although the collection system can gather several times that if enough loose material is available. After that brief contact, the arm acts as a pogo stick pushing the spacecraft away from the surface and back into space. The CAESAR spacecraft with its extended arm and sampling mechanism. Credit NASA. Again, like OSIRIS-REx, following confirmation from instruments that a sample was successfully collected, the containment system with its sample would be placed within a sample return capsule that ultimately would deliver the sample to Earth following a fiery plunge through the atmosphere. However, this capsule and its embedded sample containment system have two major innovations not needed by the OSIRIS-REx mission. For the CAESAR mission, a key goal is to return both the dusty component and minimally modified samples of the icy volatile material. Once in the sample return capsule, the sample would be gently heated to approximately -30 degrees Celsius to sublimate the volatiles out of the sample. (If -30 sounds chilly, remember that comets are deep frozen relics even following heating by the sun during their passages through the inner solar system.) The sublimated gases would flow to a gas containment system that would be kept at -60 degrees Celsius where they would either refreeze (for example, water) or remain as gases (for example, methane and carbon dioxide) depending on their freezing points. Removing the volatiles from the sample ensures that they don’t chemically modify the solid sample during the return flight to Earth. Keeping them chilled in the gas containment system also minimizes chemical interactions among the volatiles. There’s another important difference between the OSIRIS-REx and CAESAR missions. To intelligently select and later interpret samples, scientists need to understand the parent body: What is its shape and interior structure? What processes have shaped it surface? How does the composition vary across the body? The OSIRIS-REx mission is going to a body that has never been visited before. As a result, that spacecraft carries a rich payload of cameras and spectrometers to map the physical surface and its composition. If the mission only completes its survey of the asteroid Bennu but for some reason fails to return its sample to Earth, it would have told us a great deal about how this tiny primitive asteroid came to be. The CAESAR mission’s target, comet 67P, was previously studied by the Rosetta mission and its partially successful Philae lander. As a result, the CASEAR spacecraft wouldn’t need to carry its own scientific instruments. It does carry narrow- and wide-angle engineering cameras that would be used to remap 67P’s surface, which is likely to have changed during its subsequent perihelion passages from solar heating. (Identifying the changes would be a useful scientific byproduct.) From these images, the science and engineering teams would map the surface in terms of how safely the spacecraft can approach the surface, whether the surface material has physical characteristics compatible with the sampling mechanism, whether the arm can deliver the sample mechanism to the surface, and the intrinsic science value. 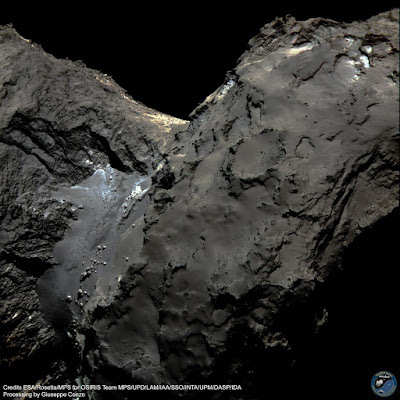 Based on maps derived from the Rosetta images, the CAESAR team is currently expecting to take its sample from one of the smooth terrains that appear to consist of material that has slumped there from the rugged terrains that would be unsafe to sample directly. The smooth terrains also likely contain material delivered from the jets that spew a cloud of volatiles and dust in the space around 67P each time it comes close to the sun. Because the rocky and organic materials appear to be nearly uniformly distributed across surface, the key deciding factor on the final sample location likely would be made based on the richness of the volatiles present. Once the CAESAR spacecraft acquires its sample, it would quickly move away from the comet to wait for the start of its journey back to Earth. If all goes well, the sample would be delivered to the Earth’s surface in the midmorning of November 20, 2038, fourteen years after the mission’s launch. Following the recovery of the sample capsule, the returned gases, ices, and solids would be carefully curated and preserved. The initial analyses on a portion of the sample would be conducted using laboratory instruments that would be 20 years more advanced than those available today. It’s expected that the samples would continue to be analyzed for decades following their arrival on Earth as scientists develop more refined questions and yet more advanced instruments. While comet P67 is a well explored world, the surface of Saturn’s moon Titan largely remains a blurry enigma. Thanks to the Cassini orbiter’s many flybys of the moon, we have low- to moderate-resolution maps of the surface that show seas of liquid methane and ethane, extensive dune fields, mountains, a paucity of craters, and river systems. We similarly have low resolution maps of surface composition differences that are frequently ambiguous as to the actual material present. We know that sunlight interacting with the atmosphere creates complex hydrocarbons and nitriles that continuously rain down from the upper atmosphere to the surface. Cassini’s instruments have observed changes in the surface following rains of liquid methane. There’s an interior water ocean that may be in contact with the silicate core that could, like the interior oceans of Europa and Enceladus, be an abode for life. What we know about the surface becomes the foundation for the fundamental questions that require a return visit. What processes have reshaped the surface, erasing, except in a few terrains, the many craters that should have accumulated? Why hasn’t the rain of hydrocarbons buried the surface over the age of the solar system, and where does new methane come from to replace that lost to the formation of the hydrocarbons? Are there cryovolcanoes that bring liquid water to the surface? What types of pre-biotic chemistries occur on a world rich in hydrocarbons? And is there evidence of life, either that formed on the surface from the interaction of water and the hydrocarbons or carried up from the deep subsurface global ocean? Or is there life based on non-water chemistries? These questions cannot be answered by landing at any single location on Titan. Fortunately, this moon’s thick atmosphere and low gravity make this the easiest world in the solar system for flight. The team proposing the Dragonfly mission have designed a rotorcraft lander that can fly several tens of kilometers in a single flight to a new site. In an hour or so of flying, the craft might travel further than the Opportunity rover has crawled across the surface of Mars in fourteen years. Over the course of several years at Titan, the craft could explore a variety of terrains hundreds of kilometers apart. The Dragonfly proposal is possible because of the recent advances in multirotor technology to enable steady flight (think of all the quadcopter hobby drones as inexpensive examples) and autonomous flight. Cassini’s maps of the surface enable scientists to identify interesting locations to visit but are too low resolution (the smallest details are hundreds of meters across) to be useful to for inflight navigation. On each flight, Dragonfly would be given a target location to fly to. During the flight, a combination an inertial measurement unit, radar, and optical navigation would be used to track progress. Once at a landing area, a laser system (lidar for those familiar with the technology) would map the site to find a safe touch down site. On arrival at Titan, the Dragonfly craft, safely enclosed in its entry capsule, would directly enter the atmosphere. Once the initial descent is completed, the Dragonfly rotorcraft would separate from the capsule and guide itself to its first landing. Much of Titan’s equatorial regions are covered by dunes that crest at 50 to 200 meters separated by flat plains two to four kilometers wide. The craft would use its sensors to guide itself to one of these interdune areas to enable that crucial safe first landing. The sands themselves are known to be composed of frozen organic particles that likely are material blown in from large areas of the moon’s surface. With its first landings in the dune sea, the Dragonfly lander can explore how far organic chemistry has proceeded on this hydrocarbon rich world. The interdune plains may also contain exposed water ice that is the bedrock of Titan’s surface. Sampling the primordial water ice crust is a high priority to explore the chemistry present when Titan formed and the surface and atmosphere may have been much different than they are today. Because Titan’s surface is likely rugged at small scales, the Dragonfly team won’t send the craft to land at an unseen location (except for that first landing). Instead, on its first flight following the initial landing, the craft would be sent to scout for a next safe landing site and then would return to the initial (and known to be safe) landing site. On the second flight, the Dragonfly craft would fly past the second known safe landing site to scout a third, and then return to the second site. In this way, the mission would leapfrog from one known safe site to the next, using its sensors to make up for the lack of high resolution orbital imagery. Beyond the dune seas, Titan has a rich variety of terrains to explore. Life on the Earth is based on organic chemistry enabled by liquid water. The surface of Titan is too cold for liquid water – the water ice is as hard as rock – but impacts would melt the ice, mixing the hydrocarbons with liquid H2O for as long as tens of thousands of years. Where liquid water and the organic material on the surface mixed, complex pre-biotic chemistry likely occurred, making Titan a natural laboratory to explore the possible origins of life. These sites would provide natural laboratories to explore the resulting pre-biotic chemistry and explore avenues for the origins of life. Cassini’s data hint at features that may be extensive cryovolcanic flows where water from the interior ocean reached the surface. If the liquid water originated in the deep interior ocean, sampling these areas may allow the Dragonfly instruments to determine the composition of that ocean, including searching for signs of any life that may exist there. While liquid water on the surface has likely been a rare event, liquid methane plays the role on Titan that water does on Earth. The methane falls as rain, flows through river systems, and ends in lakes and seas. Close to the equator where the Dragonfly craft would roam, it appears that the seas have largely dried up. The evaporation of the seas could have concentrated chemical reactions, and the present dry-to-moist surface would preserve the resulting material for Dragonfly’s instruments to sample. Several areas near the equator have been identified as possible dry sea beds. (The currently-filled methane seas in the north polar region would be in darkness and out of sight of Earth for telecommunication during the Dragonfly mission. Their exploration would need to wait for another mission a decade or so later). The public information on how far the Dragonfly craft might go in a single flight is somewhat vague – the design is not yet complete and there’s a tradeoff between larger batteries and weight and volume. One article discusses an example battery that could allow up to 60 kilometers flight. It then states that flights would be kept substantially shorter to provide a safety margin. If the average distance between landing sites is 20 kilometers when the goal is to transit distances, then over a five Earth year mission, the craft might fly 1500 to 2000 kilometers. Not all Titan days, though, are likely to be spent with the goal of putting kilometers on the odometer. If the craft finds a cryovolcanic volcano or flow, for example, it may spend many months doing short flights to different locations within the flow. Some Titan days may be spent doing aerial reconnaissance to map the feature. Other Titan days might be spent doing bunny hops between features in a single landing area. Examples of terrains within a region on Titan. The 5 µm bright areas have been interpreted as dried sea beds. The distance across the more detailed map is approximately 2700 kilometers at the equator. Credit: Dragonfly team. Rather than thinking of the Dragonfly craft as a global trekker, it seems more apt to think of it as performing the equivalent of the missions of several rovers on Mars. It would be able to transport itself between and within several key landforms within a region of the moon. Choose that region carefully, though, and there’s a rich diversity to explore. Within the black box on the map above lie seas of sand dunes, several features that may be cryovolcanic, possible dried sea beds, and what may be one of the oldest exposed terrains on the surface in the Xanadu highlands with its mountains, river channels, and possible impact craters. During its flights, a set of cameras would look forward and downward during flights to map the. 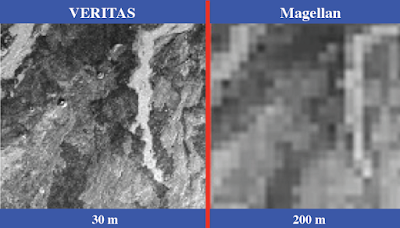 The Huygens probe showed that surface features can be distinguished in monochrome aerial images, and Dragonfly would have some color imaging capability to discriminate differences in composition. The mission’s operators, though, would need to balance the number of images returned with other demands on the mission’s power supply. The strategy would be to return thumbnails of images, from which the mission team would select a subset to be returned at higher resolution. After each landing, panoramic cameras would examine the local area while microscopic cameras take close-up images. (Depending on the wavelengths that the cameras can detect, Saturn may be visible in the images in one of the spectral windows in which the atmosphere is transparent.) Once on the surface, a gamma-ray and neutron spectrometer would measure the bulk surface composition to discriminate between, for example, pure water ice, ammonia-rich water ice, and a layer of hydrocarbons. Several instruments would study meteorology both in flight and on the surface including temperature, wind, and the methane humidity. Two instruments would listen for seismic activity and measure variations in the extremely low frequency electromagnetic field to study the subsurface to the depth of the interior water ocean. Other sensors would record the thermal and electrical properties of the surface immediately around the landed craft. The mission’s star instrument, however, would be its mass spectrometer. This instrument, derived from similar instruments for the Mars Curiosity and the European ExoMars rovers, would be able to detect the presence of different ices and hydrocarbons at minute levels. By measuring the precise chemistry of ices from different locations, scientists can understand the processes that created them. This instrument’s sensitivity would make Dragonfly an exciting astrobiology mission. It could, for example, measure tiny amounts of key organic compounds such as amino acids, lipids, and sugars, as well as the chirality of organic molecules. At the minimum, Titan should have a treasure trove of pre-biotic material that scientists would use to explore the chemical pathways leading to the complexity of life. And Titan is a possible abode for life, either as-we-know-it based on water in the deep ocean or novel forms of life based on liquid methane. Proving that life exists at the cellular level likely would be hard, but Dragonfly’s measurements could be the bridge to future, even more sophisticated missions. Both CAESAR and Dragonfly would be compelling missions. It is unfortunate that only one will be selected and the next competition is likely to be several years in the future. Launch for the CEASAR mission would occur in the summer of 2024 and arrive at comet 67P in December 2028. The spacecraft would depart from the comet in late 2033 and return to Earth five years later. Launch for the Dragonfly mission would occur in 2025 with arrival at Titan in the mid-2030s. Absent a crash or equipment failure, the length of the mission would be dictated by the slow decay of power delivered from its power supply. Eventually it would take two, then three, and then more Titan days to recharge the battery. At some point, power would be too low to enable any flight. Then the craft would become a stationary science station as power gradually fades until it becomes silent likely sometime in the late 2030s or 2040s. The decision between these two excellent but fundamentally different missions will be made in mid-2019 by NASA’s Associate Administrator for Science. His decision will determine whether the 2030s brings a flowering of science for comets or Titan. I would like to thank Steve Squyres, principal investigator for the CAESAR proposal, and Elizabeth (Zibi) Turtle and Jason Barnes, PI and deputy PI for the Dragonfly proposal, for their comments on an earlier draft of this story. When I wrote my blog post on the New Frontiers mission proposals, I could identify eleven of the twelve proposals. One, though, then had no public trace. Shortly after my piece was published, several people emailed me to tell me that the twelfth proposal was a third Venus mission called the Venus Origins eXplorer (VOX). However, they offered no details on its implementation. Now the team proposing the mission will present its implementation at an upcoming scientific conference. Their abstract for the talk reveals key facts about the proposal, and it’s a gutsy break with the missions that have been assumed for New Frontiers Venus missions. 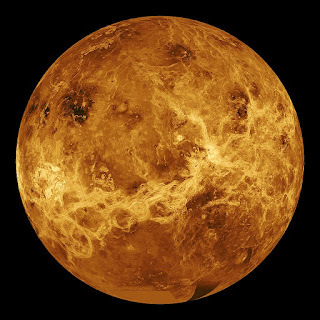 NASA's Magellan spacecraft mapped the surface and gravity field of Venus in the early 1990s. The VOX mission would return with a modern suite of instruments to remap the surface and study the lower atmosphere. Credit: NASA/JPL. To understand the strategy the VOX team is following, it’s useful to look at the history of the Juno Jupiter orbiter mission. Every ten years, the planetary scientific community establishes its priorities for the exploration of the solar system in process known as the Decadal Survey. The 2003 Decadal Survey report called for a Jupiter Polar Orbiter with Probes mission. The orbiter was to study global patterns and the magnetosphere while three atmospheric probes were to examine the composition and deep structure of the atmosphere. Unfortunately, since the Galileo mission with its shallow atmospheric probe, the United States has lost the technology to build probes capable of entering Jupiter’s atmosphere. The team that proposed the Juno mission focused on the desired scientific goals and demonstrated that they could be met with just an orbiter with the right instruments. Based on that well-presented argument, the mission was selected and is now orbiting Jupiter. The goals for a New Frontiers mission for Venus have assumed an atmospheric probe that would also conduct surface measurements once it landed. The scientific requirements NASA’s managers established for a mission appear tailored for that kind of a mission based on the goals set out by the more recent 2013 Decadal Survey report. For example, the ratio of key gasses and their isotopes can only be made by a probe that enters and directly samples the atmosphere. With those measurements, other questions such as past hydrologic cycles and the existence of now lost oceans can be addressed. During its descent the probe could measure the properties of the atmosphere, its clouds, and its winds at different altitudes. Measurements of the atmosphere at the surface could address the weathering environment of the crust. Chemical analysis of the soils and rocks at the landing site could provide insight into the physics of and chemistry of the crust. The key elements of the VOX proposal closely resemble the VERITAS mission that was a finalist for the last Discovery program mission but not selected (losing out to the Lucy and Psyche asteroid missions). The principal investigator for VERITAS and VOX are the same, Suzanne Smrekar at the Jet Propulsion laboratory. The core of the VERITAS proposal was an orbiter that would carry a modern radar instrument to remap Venus and a spectrometer to measure the surface composition and study key aspects of the atmosphere. 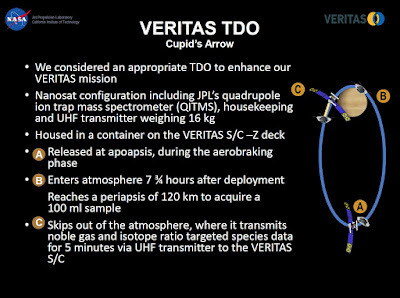 If selected, the VERITAS mission team was considering proposing a small atmospheric probe call Cupid’s Arrow to toe-dip into the atmosphere to make key composition measurements. A version of that probe now called the Atmospheric Sample Vehicle (ASV) would be included in the VOX mission. 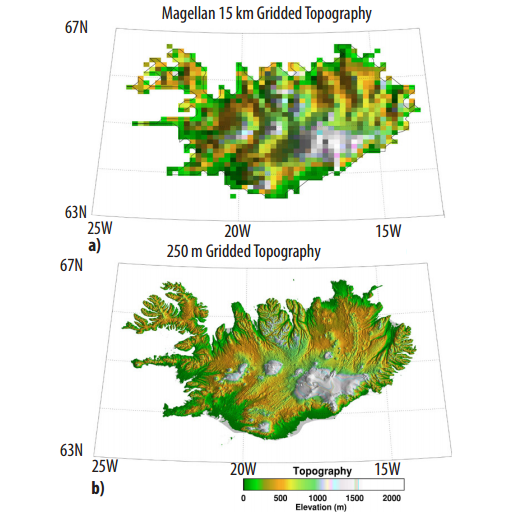 A radar instrument would image the surface at 15- to 30-meter resolution, map elevations to refine topography measurements, and search for minute changes in surface elevations to look for evidence of current volcanic or tectonic activity. The improvements in resolution for each of these would be one to two orders of magnitude better than those made by the Magellan orbiter in the 1990s. The Venus Emissivity Mapper (VEM) would use spectral bands in five near-infrared wavelengths where the atmosphere is transparent to map the surface composition. Measurements in additional bands would study cloud structure and the presence of water vapor in the lowermost atmosphere. The ASV would be a small probe released from the orbiter. The probe would enter and briefly traverse the upper atmosphere where it would collect a small sample of the gasses present before its momentum carries it back into space. Once back above the atmosphere, a miniaturized mass spectrometer would measure the composition of key gasses and their isotopes. By only toe-dipping into the atmosphere, the probe doesn’t need protection from the crushing pressures and extremely high heat on the surface that the atmospheric probes of the other New Frontiers Venus proposals require. 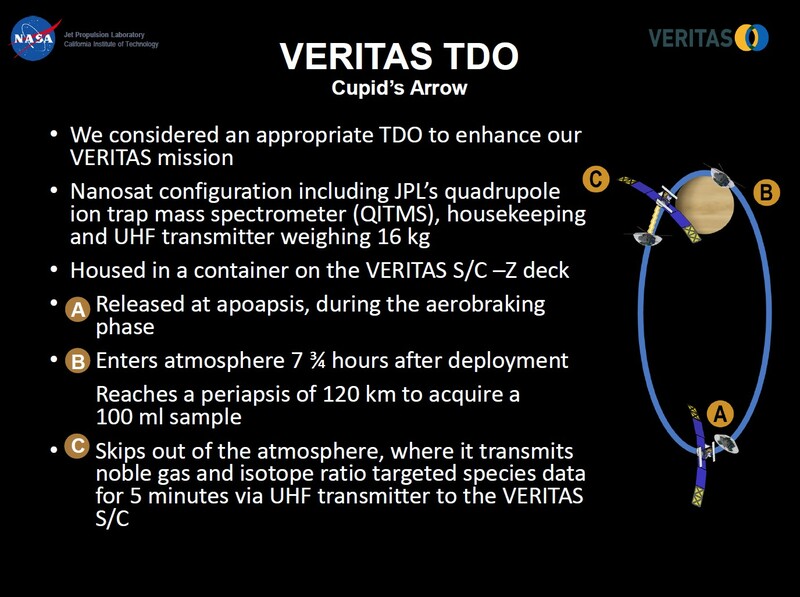 The VOX mission's Atmospheric Sample Vehicle would be based on the Cupid Arrow probe concept. Credit: NASA/JPL. While the VOX mission is in competition with the two Venus entry probe-lander proposals (and nine other proposals for other solar system destinations), in many ways it is a compliment to those two missions. Within the column of air in which they descend and in a square meter or so at their landing sites, the two proposed entry probe-lander missions would make much more detailed measurements than VOX’s radar and VEM instruments would from orbit for the same location. The VOX spacecraft’s instruments, however, would make those measurements over the entire planet over at least three years (and possibly much longer in an extended mission). 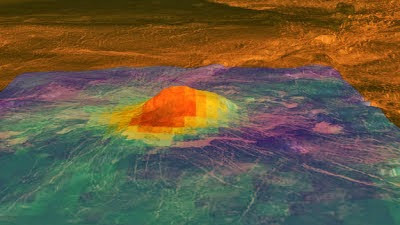 The VEM instrument, for example, could look at the surface of every volcano on Venus searching for the presence of minerals suggesting recent lava flows. The radar images could show whether the features on the surface are consistent with new flows. Radar interferometric measurements could look for small surface deformations that could reflect surface movement from earthquakes associated with eruptions or swelling from underground lava movement. VEM measurements of the atmosphere could look for changes in water vapor associated with volcanic outgassing. And the gravity field measurements would tie each volcano to the interior structure below the surface. The VOX mission would make comparable studies for all the surface types on Venus as well as monitor the lower atmosphere. Perhaps most important of these would be observations of the tessera, which are continent-sized highlands that likely are the oldest surviving surfaces on the planet. For these, the synergy of composition measurements, surface imaging, and interior structure measurements could reveal key aspects of the earliest history of Venus including the role of liquid water and other volatiles in the then cooler times. In one set of measurements, the VOX and the two Venus entry probe-lander missions are in direct competition. In much the same way as strata of rock record geologic history, the presence and abundance of key gasses and their isotopes record the origin and evolution of the atmosphere. Because the Venusian atmosphere is in contact with the surface, it also records key geological events. Measurements of xenon and its isotopes, which have yet to be made at Venus, for example, would resolve key questions about the origins of the atmosphere. Xenon measurements also would reveal the total amount of degassing from the planet’s interior, which reflects the cumulative volcanic activity. Similarly, a long-lost ocean at Venus would be reflected in the ratio of hydrogen isotopes. The US Pioneer Venus and Soviet Venera entry probe and landers carried now-antiquated mass spectrometers that could not make key composition measurements such as the isotope ratios of xenon. The VOX mission’s atmospheric probe would deliver a modern mass spectrometer to Venus that would answer the key first order atmospheric composition questions. The other two proposed Venus missions would carry much more sophisticated instruments that could also address second and third order questions. By descending all the way to the surface, the probes on these other missions would also study changes in composition at different layers of the atmosphere and look for compounds that reflect the current weathering at the surface. In the last New Frontiers competition, a Venus entry probe-lander was a finalist but lost out the OSIRIS-REx mission now inflight to return a sample from the asteroid Bennu. 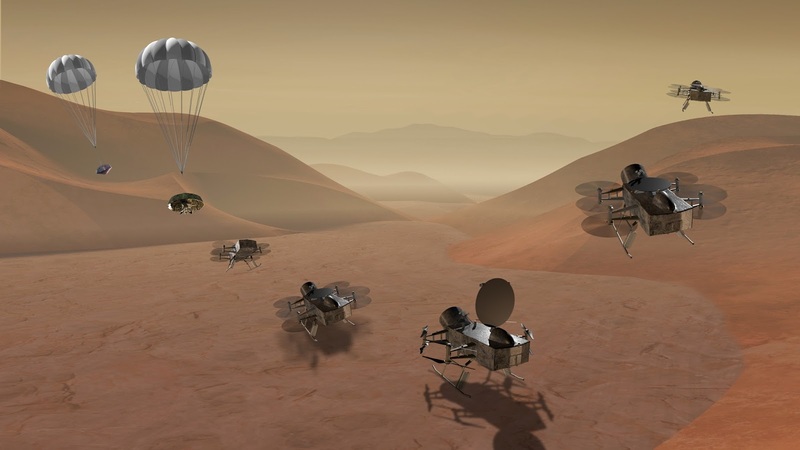 For the current Frontiers competition, NASA will select just one mission from among three proposals for Venus, one to return samples from the moon, three to return samples from a comet, and four to study Saturn or its moons. It’s a tough field. By the end of this year, we’ll learn whether VOX is selected as a finalist in the current competition with the final selection planned for 2019. 1. Atmospheric physics/chemistry: noble gases and isotopes to constrain atmospheric sources, escape processes, and integrated volcanic outgassing; global search for current volcanically outgassed water. 2. Past hydrological cycles: global tessera composition to determine the role of volatiles in crustal formation. 3. Crustal physics/chemistry: global crustal mineralogy/chemistry, tectonic processes, heat flow, resolve the catastrophic vs. equilibrium resurfacing debate, active geologic processes and possible crustal recycling. 4. Crustal weathering: surface-atmosphere weathering reactions from redox state and the chemical equilibrium of the near-surface atmosphere. 5. Atmospheric properties/winds: map cloud particle modes and their temporal variations, and track cloud-level winds in the polar vortices. 6. Surface-atmosphere interactions: chemical reactions from mineralogy; weathering state between new, recent and older flows; possible volcanically outgassed water.